Continuing looking at vendors, I hope these tips help stretch your wedding budgets, whether you are a bride to be or a mother of a bride to be or the mother of a groom to be. Weddings can cost a fortune if you buy into the hype. But with some savvy shopping, trap avoiding knowhow and DIY willingness, they can be dreams fulfilled without busting the budget. When you start shopping for attire for you, your bridesmaids, groom, and so on, there are a lot of little hang ups for something that should be so simple. Afterall, they are just clothes albeit more ornate. Here are some things that might save you some nickel and dimes. 1. Consider Samples. This actually comes two fold for the bride and the bridesmaids. Sample dresses can be great deals and seamstresses can do amazing things as long as its within a size or two. Most sample wedding dress come in size 10 so if you are a size 8-12 this might be a great way to get a good deal. Typically these dresses are either discontinued from a line so the store doesn’t need the sample any longer or they are making room for new ones. I took this route. My dress was originally almost $1400 and I got it for $600…that’s almost a 60% savings! 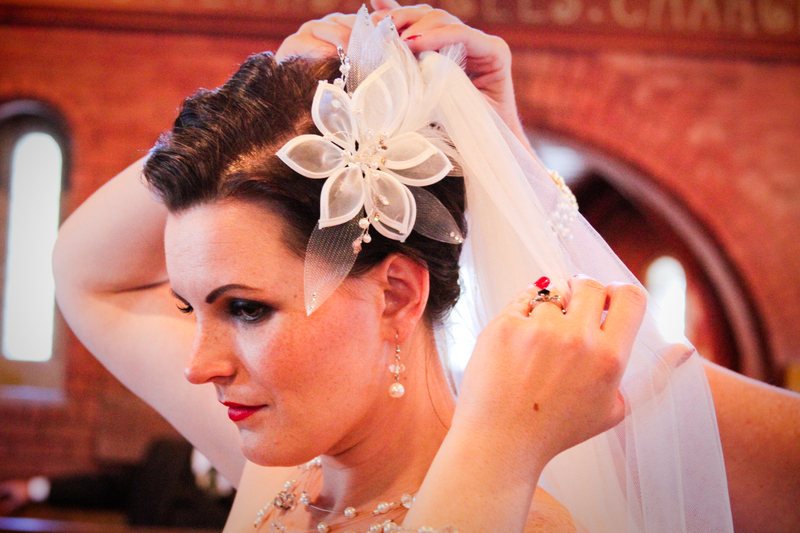 Plus it allowed me to get the veil and headpiece I loved! Plus the veil I purchased was discounted because I bought the dress and I happened to notice the headpiece was missing two small rhinestones that were easily replaced so thinking it wouldn’t hurt to ask, I asked could I get a discount since it was technically “broken” and I did. 2. Try off the rack. This is a great option for bridesmaids dresses, shoes and even the bride’s dress! All of us have either been in or seen bridesmaids dresses that are so very much a bridesmaid dress that they would never be caught dead in them again. Try going to the evening dress section of a department store and select a dress that they could wear again. Not only is it most likely going to cost way less than buying it a at a bridal store, they get the added bonus of extra wear! If your wedding is a little more casual, it can work for the bride’s dress too. I found my shoes at Marshalls and LOVED them. They went perfectly and only cost $30! Bought some at David’s Bridal for a different wedding and all in it cost almost $120. I was also able to find my bridesmaid dress for the last wedding I was in at Dress Barn. 3. Consider buying instead of renting. 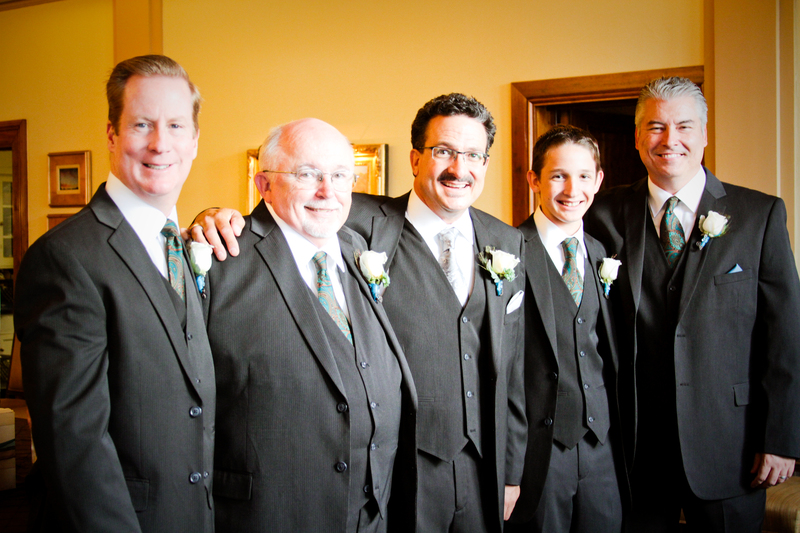 We did this for our groomsmen and my husband. I really wanted a pinstriped suit. My husband a tux. But I won the battle when we priced both and for just a little less than what it would cost to rent a tux, our groomsmen could buy a suit. Added bonus…they get to wear it again and it was custom fit to them. And I am happy to say all them have worn it at least two or three or more times since including my 16 year old son. 4. Make it your something borrowed. How often are you really going to need a crinoline petticoat? Its not like we are in the 1850s where big hoopskirts and petticoats were a must. If you know someone who recently got married and you feel comfortable, see if you can borrow something. My good friend borrowed her sister’s tiara for her headpiece. I borrowed my underskirt from a wedding dress modeling session I did a few years back. I have heard of others borrowing jewelry, veils, and more. 5. Go online. Believe it or not, you can get some really good deals on-line. I know some brides have found their dresses at deep discounts because they bypassed the bridal shop. I know my cousin found her wedding dress on eBay and it looked stunning. 6. 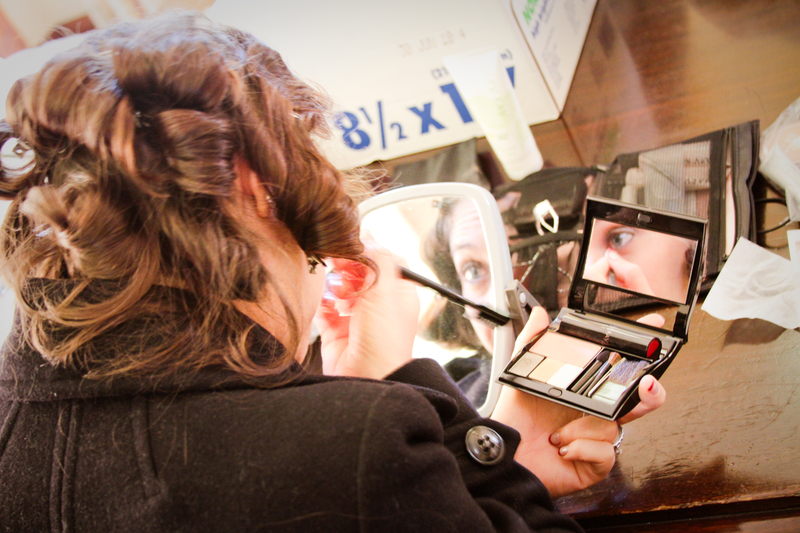 Do It Yourself – Make up and Hair. This can be a huge savings and is far more common than you think. If you give yourself enough time to practice and make sure you feel confident, you would be surprised but you will become quite skilled at doing your hair and makeup. Practice, take photos in various lighting settings and practice some more. And you could save yourself any where from $150 to $300 per person for hair and makeup. 1. Reduce and eliminate. You can save a whole lot of money by reducing what you order. This can either be by reducing the guest list or by reducing the items you order. 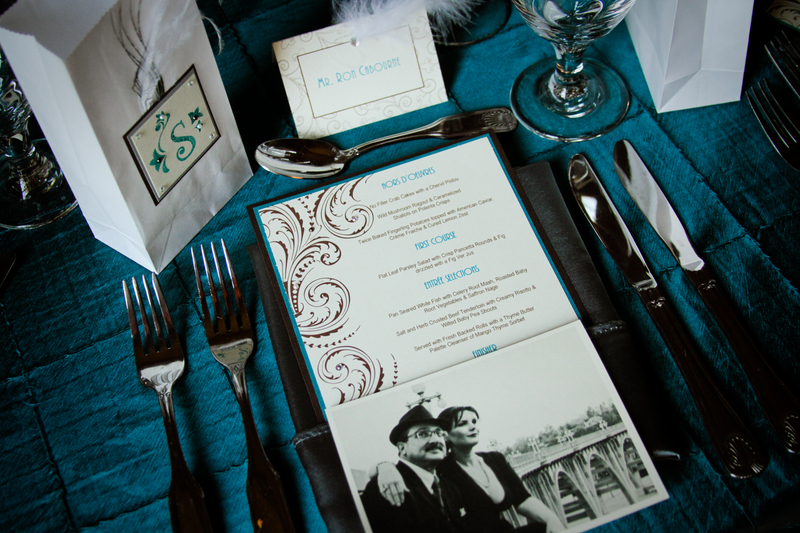 Programs, menus, place cards, pew cards, and ceremony cards can all be eliminated. You can also eliminate engagement and wedding announcements. Calligraphy is also typically used for very formal weddings so most likely you can cut this cost. You can combine items such as ceremony cards and initiations and/or reception cards. 2. Do-It-Yourself. There are some awesome kits that are out there these days. They look beautiful and can look extremely professional as well. They are a fraction of the cost of printed invitations and when you customize them, they can even look more luxurious than those professionally done. 1. Select a la carte services. Decide what you really need. Do you really need a photo booth set up at your wedding? Do you really need a second photographer? How long to do you want them there? Do you need extra prints or would getting the CD/negatives be a better option for you? 2. Do-It-Yourself Extras. Shuttefly and so many other companies are out there where you can take the photos from your wedding and turn them into beautiful parent and family albums. 3. Get a Little Help from Friends and Family. Hire a photographer to get the ceremony and special moments like the cake cutting, bouquet and garter toss, family photos and party photos. Have disposables on the tables at the wedding reception and have guests take photos. Also, if you have a photographer among your family and friends see if they can do your photos for you. My niece-in-law did this and they were beautiful. 1. Be selective in your flowers. Some florist charge extra for “more special” flowers. Stephanotis, orchids, and certain other flowers are often considered exotic flowers and some florist charge extra for these. Ask your florist if they do and if so, look at seasonal flowers that are from the time your wedding will take place. 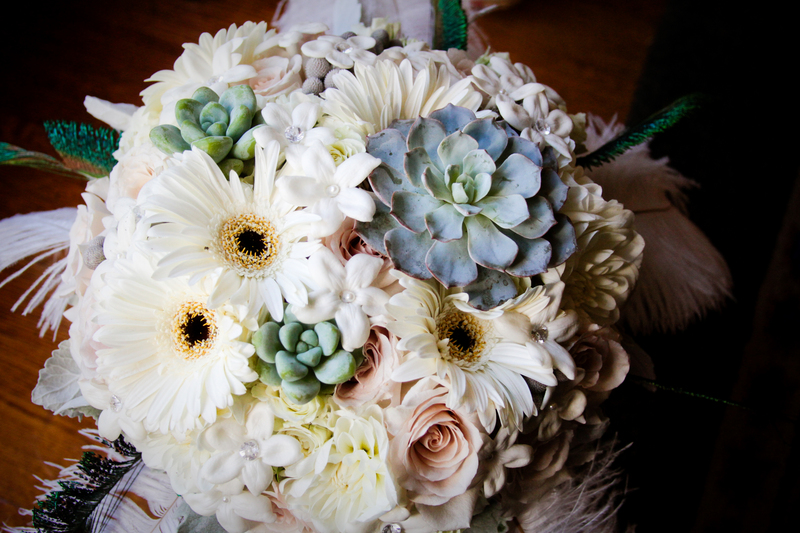 More bulk flowers such as carnations, Gerber daisies, and greenery are good low cost alternatives. 2.Reduce the amount you need. Flowers add up when you add arrangements. You can reduce costs by cutting out the nice to have but not needed elements. Boutonnieres for fathers, corsages for mothers, going away bouquet, flowers for the buffet table, punch table, cake table, toasting glasses, and aisles are nice to have but are not needed. 3. Be creative in your centerpieces. Centerpieces do not have to be flowers. These days they can be almost anything. I have seen beautiful centerpieces made of floating candles, feather arrangements, and pumpkins, gourds and pinecones in the fall. 4. Go simple. Consider single roses or other flower in a single vase for the centerpiece. Consider rose petals sprinkled as decorations on extra tables. Three tiered roses make beautiful and simple bouquets for bridesmaids and simple boutonnieres made of single roses run about $5 a piece. 1. Use your own. Unless you really want something special, consider hopping in to your own ride to get to and from. 2. Borrow someone’s. If you know a car lover, ask if they wouldn’t mind being your driver to the ceremony and to the reception. 3. Get creative. My friend used a old green bus that her family had to get us all to the wedding. It was super fun and unique. Do-It-Yourself. My niece-in-law, my good friend and I all took this route and all in different ways. I did my own “candy bar” and boy did I save. These can cost upwards of $500, mine was about $150 for the containers I had to buy and the historical candy. Plus, it made an awesome setup for my cake to be front and center. My niece-in-law found a chocolatier and ordered a single piece of amazing chocolate, added a personalized ribbon and used it as a decorative element on the plates. My friend found an awesome deal on incense and wood burners. She had small bags for guests to grab ten scents and her husband engraved with a wood burner their names and wedding date. 1. Eliminate options. The more the caterer has to cook, the more the caterer has to buy and therefore the more it will cost. Consider 3 hors d’oeuvres versus 5 or 6. Have two set options for meals that people pick in advance versus two or three entrees served at a buffet. Nix the dessert. You are serving cake so you do not need a separate dessert. Keep beverages to what is included in your package. Sodas often costs more but most come with tea, water and coffee. These are perfectly acceptable. 2. 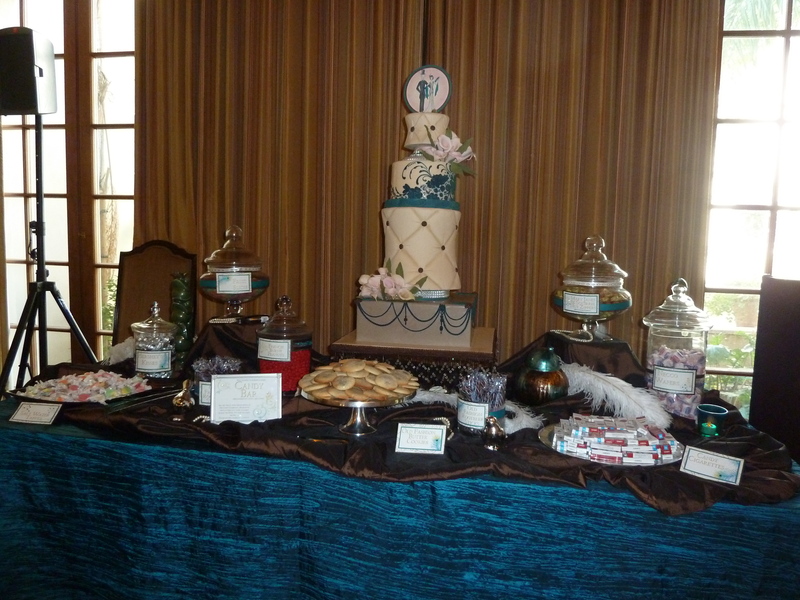 Buffet or Sit Down – Talk to Your Caterer. Most people would say a buffet costs less but ask your caterer. If you are serving a buffet, even if it is being staff so portions are controlled, people go back for seconds. So caterers usually have to make more to account for it. Served meals may end up costing you less since portions and food amounts can be controlled. Servers are about the same as a staffed buffet so they don’t really factor in. 3. Reduce how long the bar is open. Consider having wine on the table and let the bar be open during the cocktail hour. By keeping the bar open for a limited time whether you choose an open or no host bar, you reduce your costs either by reducing the number of man hours or the amount of alcohol consumed. 4. Consider less expensive options. Instead of fish and steak, consider less expensive options like a pasta, vegetarian option or chicken or pork. These often cost less. 1. Cut the Groom’s Cake. These are often a tradition in the south but you can cut costs by either removing it all together from the wedding or shifting it to the reception where there are less people. 2. Reduce the size. No matter how well we plan, there is almost always someone who does not show up. Plus, some people skip cake so consider reducing the slices you order by about 10%. So if you have a 100 person wedding, order about 90 slices. 3. Go Grocery. Many grocery stores provide typical wedding cakes and if you are not hung up on your cake like I was, they are extremely affordable. 4. Bring your own boxes. 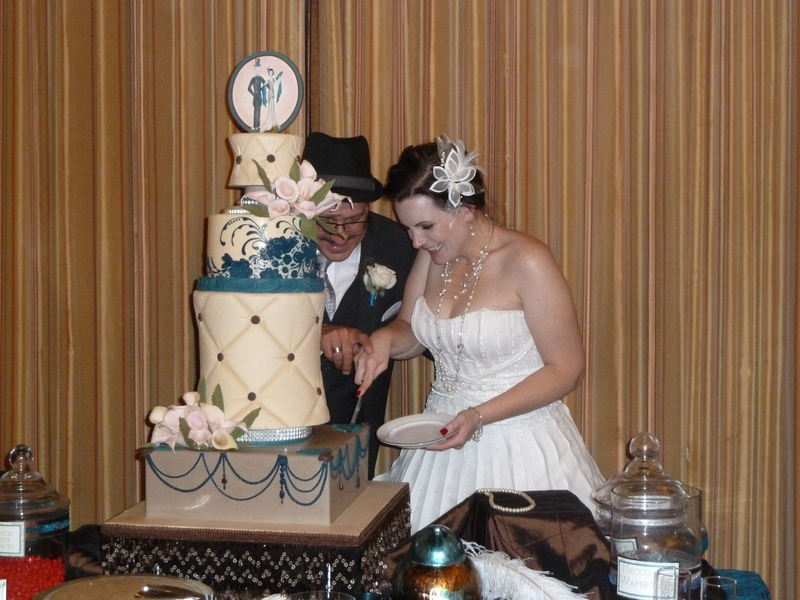 There is almost always leftover cake and most cake artists usually charge for boxes for leftover cake. Head to Party City and get your own for a fraction of the cost. Know Anyone? Best advice here is to know someone. This is not an iPod situation. DJ, band or musician. Its a real talent and its one that you really can’t do yourself. But if you know someone, then see if you can work a deal. My cousin’s second husband was a musician so his band was their music. I have heard of others doing similar. 1. Do-It-Yourself. There are so many resources out there that while it is time consuming, you can do this yourself and save big. 2. Consider a day coordinator. I would highly, highly, highly recommend hiring a day consultant for your actual wedding day if there is not a consultant on site. The last thing you need to be doing is running around and paying consultants, making sure vendors are feed, making sure people are led in, and you can’t be there to coordinate arrivals. I got incredibly lucky. A friend that is an event planner volunteered to help and was my coordinator for the day. But I looked into this and day coordinators can cost about $300 to $1,000 so shop around. You can also ask someone you trust who is not invited to the wedding and offer to pay them for the day to coordinate arrivals and departures. Hope this helps and you are finding this enjoyable. Next post I’ll be looking at décor and venues.